I originally had a slightly different version of a farm animal storytime planned, but I heard two days before my storytime that the daycare was very short-staffed that week and they were having to combine the 3-year old class with younger classes. So instead of 3 longer books, I chose 4 shorter books and figured I could pick and chose what to use on the fly, depending on how things worked out. 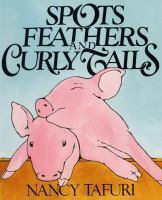 So, after our usual welcome and lead-in songs, we started with Nancy Tafuri's Spots Feathers and Curly Tails. This is a great little interactive book for younger kids. 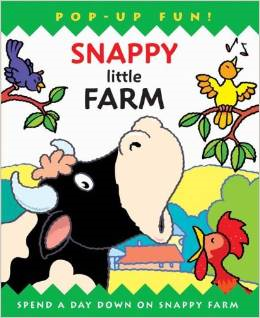 Each page shows a small part of a farm animal and the kids guess what it is, then the whole animal is revealed when you turn the page. 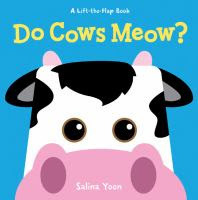 Since this book was so short and simple, and we ended up not having the younger kids after all, I followed up immediately by saying, "Now we've seen how well you know what farm animals look like, we'll see if you know what they sound like," and read Do Cows Meow?, a lift-a-flap book by Salina Yoon. Again, this is another short, simple book with bright illustrations perfect for younger kids that lets them guess the animal sounds. These books pair together very well. The cows on the farm go "Moo, moo, moo;"
"moo, moo, moo;" "moo, moo, moo." The cows on the farm go "Moo, moo, moo"
I used my "animals-on-a-stick" to let them know which animal we were doing next. These are just simple clip art images I printed, cut out, laminated, and hot-glued to craft sticks [the clip art I used is no longer available, but I'm sure you can easily find some]. Then we had a lot of fun with an action song where we got to pretend to do all the things a farmer does early in the morning: "This Is The Way We...."
This is the way we so early in the morning. I love simple songs like this, where you can modify and add verses to suit your theme, and stretch them out as long as you need to fill time or work out all the wiggles. 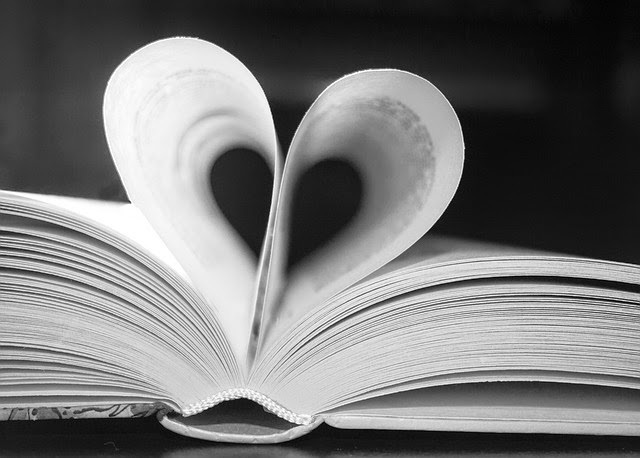 I ended the song with a verse using the phrase "This is the way we read a book" to settle them back down on the rug for our last story, Clip-Clop by Nicola Smee. This is a fun little story about a horse giving some of his other animal friends a ride. They urge him to go faster and faster until they almost fall off and ask him to stop, which he does too suddenly, sending them flying over his head into a haystack. At first the horse is afraid his friends might be hurt, but instead they all cry "Again!". 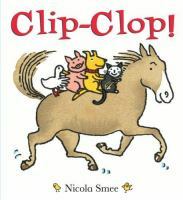 This has a fun repetitive "clip-clop, clippety-clop" refrain that they kids can join in on. After that, we ended with our closing song. As it was, I could have stuck with my original plan since the younger kids didn't join us after all, but this one still worked and the kids had fun. The teacher warned me they were extra hyper that day, but they settled down just fine once we got into our routine. They liked all the stories even though the first two were really meant for slightly younger kids. They were disappointed the pop-up book wasn't longer and informed me that they were ready for longer stories ;) But I figure it's always better to leave them asking for more, right? They LOVED Clip-Clop and joined in with either saying the clip-clop's or making sound affects; they laughed hysterically when the animals were thrown into the haystack. They really had fun making all the animal noises in the first song and doing all the actions in the second song. This is one theme that is guaranteed to work well and a great starting point for anyone new to doing storytimes.